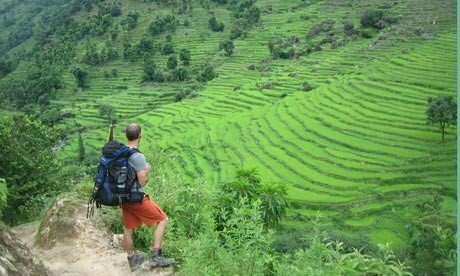 Most conflict-hit countries adopt a "don't mention the war" attitude when trying to boost tourism, but Nepal hopes that by inviting trekkers to follow in the footsteps of Maoist fighters, it can turn the country's decade-long conflict, which ended in 2006, into something of an attraction. The so-called Guerrilla Trek offered by Swiss Family Treks passes through remote settlements where rebels once sought cover from army bombing raids during the insurgency. It is one of the new routes into previously closed areas being promoted during Nepal Tourism Year 2011 (NTY2011). The 13-day trail climbs steeply up to altitudes of nearly 4,000m (13,000ft) and temperatures are subzero during the winter. Tourism chiefs, who clearly have faith in the stamina of foreign visitors, hope the new route will help double tourism numbers to a million. Given the unstable state of the Nepali government, the sound of booms in dense forests coupled with the sight of armed figures emerging from the trees adds an alarmingly real sense of danger. Luckily (for humans, at least), these men are hunters, their victims mountain goats. In the village of Thabang – the cradle of the revolution, where key attacks were planned – hikers cannot miss the communist flags still fluttering in the breeze. Less noticeable but far larger is a new poster painted on a guesthouse wall that advertises the villagers' new cause – NTY2011. Few tourists have ever come here. During the bitter conflict, walkers were routinely stopped at gunpoint and ordered to pay fees. Today's Maoists in Thabang are almost frighteningly friendly, and quite likely to walk up to visitors and shake them vigorously by the hand as they declare their political allegiance.